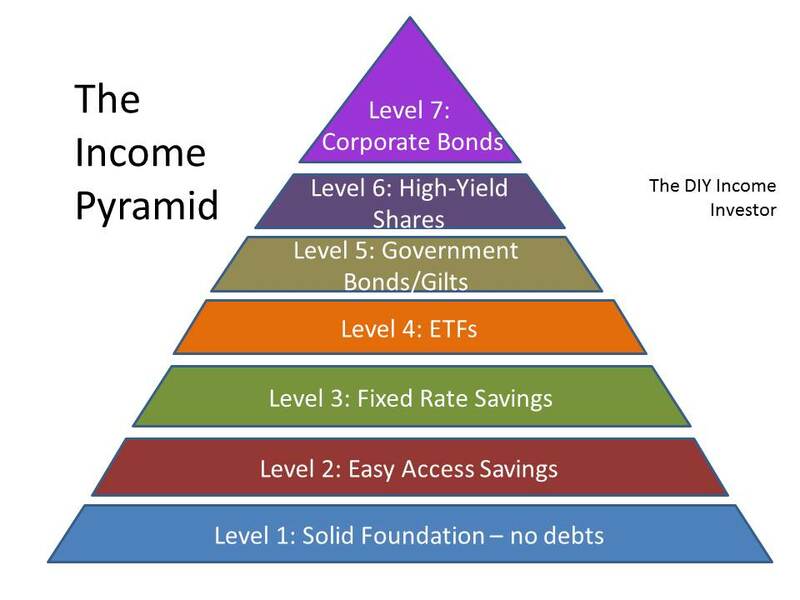 The basis of The DIY Income Investor approach can be summed up as the Income Pyramid, which consists of different layers of income, using different asset classes. 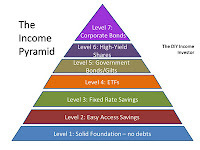 The foundation of this pyramid is Level 1: tackling your debt, including and paying off your mortgage. This is obviously a major hurdle for many people - and one that may take some time to achieve (it did for me). This is not to say that you cannot begin to experiment with some of the different income-producing assets in the higher levels of the Income Pyramid - just that your focus needs be to on paying off debt. You may get lucky with an investment (usually a share holding) and make a lot of money quickly - but this is not a way to build wealth reliably. The key approach (I believe) is to live well within your means, save hard, have no debts and invest wisely. Hopefully the DIY Income Investor approach will resonate with you as a logical and sensible path to wealth over the coming years. As you save and invest, if things go well you will experience the Money Snowball - when your debts start to disappear more quickly than you thought possible and your savings seem to take on a life of their own and multiply without you having to do much to help. It is like a snowball rolling down a hill gradually increasing in size as well as increasing in speed. You are getting richer, faster. This Money Snowball is linked to the 'miracle' of compound interest. And not just interest, of course, your income from shares and bonds/gilts, will allow you buy more income-generating assets to speed your own Money Snowball. It can be difficult if you are just starting out saving and investing - things may not seem to be moving very fast. However, after a while, although progress may seem to be acting slowly, you will begin to see a definite trend emerging - for example, by comparing today's total balances with those of two or three months ago. We found the Money Snowball effect most noticeable when we were paying off our mortgage - as the balance came down we had more cash to pay off more of the capital, and so on over and over again, helping the Snowball to roll faster and faster. Warren Buffett - one of the greatest investors the world has ever seen - grew up with a money obsession - he hated to spend money (unless it was making more money). Why? Because behind each dollar bill he could imagine the trail of interest or dividend payments that the dollar could produce in the future. At an annual growth rate of 5% his dollar would become two dollars in 15 years, and would continue multiplying. The Wealth Potential is the surplus cash you have to save or invest. So the greater this is, the faster your wealth can grow. The faster your Income Snowball will roll. Obviously, if your Wealth Potential is negative, you will need to do something significant about it - either increasing income or decreasing expenditure! Reducing expenditure is not easy, if you haven't tried before. The funny thing is - once you start it gets easier and easier. Why? Because it is a state of mind. It is about 'decluttering' your mind (and inevitably your home) by focusing on what is - and is not - important. If you haven't done so already, have a look at Zen Habits' guide to decluttering - that should start unlocking your mind-set. Once you have a rough list, work out the annual total and the percentage of each item. Identify the biggest items (e.g. food & drink will probably be one of the largest) - you need to think in more detail about the largest items. I'm guessing that you won't capture all of your expenditure the first time. As the bills come in (or you notice you're spending on something you haven't included) - add the item or adjust the estimate you made. The less you spend, usually the more you save - the more financial potential you generate. This is in many ways the hardest part of the approach - put the Money Saving Expert (UK) at the top of your Internet 'favorites'. You shouldn't think about investing until you have your debts under control. You are (probably) paying income tax on all that debt repayment, whilst the same money should be generating tax-free income for you. The interest payments on your debts (particularly credit card debt) is more that you could reasonably make by investing. So you need to pay off the debt as an absolute priority. This applies to student loans and mortgages as well - see here - although you should also have some cash savings in reserve, too. Of course there might be some reasonable judgement about trying a little bit of investment whilst you have a particularly low rate of mortgage or student loan repayment. You will find that the DIY Income Investor approach makes it easier to make these sorts of decisions - as it is all about comparing 'after tax' returns. The best place to start reducing other expenditure is with your largest cost items. There is always a way to reduce the cost, if you apply your mind to it. never buy branded goods (i.e. use supermarket brands or their budget lines) - if this is hard for you: why? (Hint: advertising brainwashing...). Blind tests have shown that most people can't tell the difference. A second major cost item is likely to be holidays. Either skip the holiday this year, or think about a cheaper one nearer home. Bundling your TV, telephone and broadband could save a lot too - see here. To get you thinking further, I have also identified 50 things you do not need to spend your money on. Another approach: Stop Acting Rich! You are saving for a reason - I'm guessing that you are aiming at some form of financial independence: to cover periods of unemployment, a career or lifestyle change or retirement - or even for a legacy to leave children. One way to focus on a target is to identify what income your would need - either temporarily or permanently. To do that you need to know your expenditure - and this is where Step 2 really pays off: the lower your required expenditure, the easier it is to reach your target income. Obvious, really - but think about it for a bit. If somehow you could reduce your expenditure, you could reach your financial goals more quickly. You could save years of your life for things that you want to do, as opposed to things you have to do. On The DIY Income Investor we give you a number of tools to help you make the best use of the cash you are saving - or perhaps better ways to invest any savings and investments that you might already have - making your money multiply more quickly. Your plan will be based on a spreadsheet - starting with your current income, expenditure and savings and projecting this forward as many years as you want to. This is pretty easy to do, once you get started, even if you are not familiar with spreadsheets. The target will be to try to cover your expenditure (hopefully now significantly reduced) from your savings and investment income. You could build a graph of your estimates for the future. Tracking your costs, income and savings is also essential. We found initially that after only a couple of years, our initial estimates of savings and income generated from our investments have been exceeded by a large margin. Tracking income and expenditure isn't actually hard to do - you only need to update the information once a month or even less frequently. But keep the old numbers and estimates, and amaze yourself with how well you have done. After a couple of years you will begin to see the benefit of your actions and understand better why less is more.